Book a Private Xi'an Night Food Tour with Muslim Quarter,your private tour guide will take you to explore the Night Food Markets and alleyways for a truly exotic experience. At around 5pm, your Xi'an private tour guide will pick you up at your hotel lobby or Xi'an train station. You will find a welcome signage "Xi'an Private Tour". And Your tour of Xi'an Private Night Gourmet Tour with Muslim Quarter start. First you will visit Bell Tower, which is brightly illuminated in the evening. In Chinese history from Ming Dynasty, each city had a bell tower and a drum tower. The bell was sounded at dawn and the drum at dusk each day in ancient time, a means of telling time. Xian was not exception. 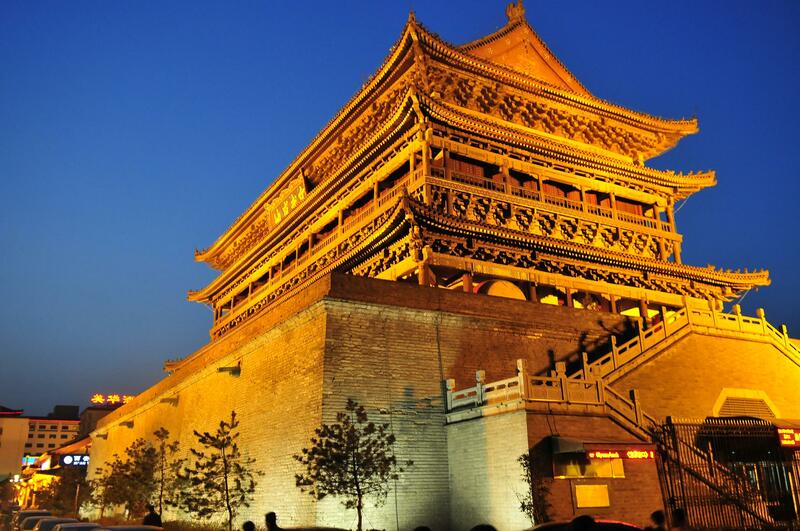 The Bell Tower of Xi'an date back to the Ming dynasty (1368-1644). The two are located in the center of the Xian city connecting the four roads from east, south, west and north within the city wall. Atop the Bell Tower you will have a panoramic view of the Xian City. Then head to Muslim Quarter, which is located in Muslim Community, behind the Drum Tower. 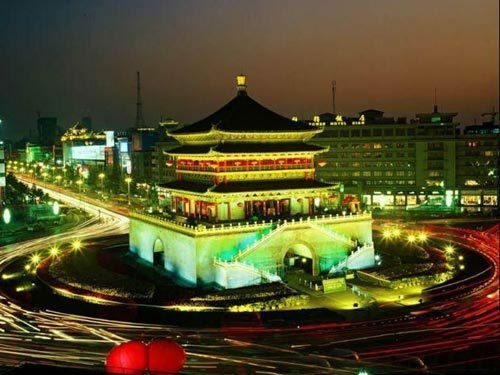 Muslim Quarter colloquially called "Huifang" or "Huimin jie" in Chinese, which is the most famous food street in Xi'an. It consists of Islamic food area, ethnic group shopping center, Great mosque and living area of Hui people. There are over 300 Muslim local snacks on the streets in Xian Muslim Quarter that attract a consistent flow of visitors everyday coming here to savor or just have a glimpse. It is a place distinct for its delicious food and Islamic culture, with a history of more than 1000 years. The streets are paved by gray flagstone and the buildings are of Ming style. About 2000 years ago in the Han Dynasty after the opening of Silk Road, Changan welcomed the first Muslims: Muslim businessmen, envoys, and students. The food in the street is of north and west flavor, in which crude pancake in mutton soup, cold rice noodles, Chinese hamburger(Rou Jia Mo), Qishan noodles are famous Shaanxi food. Besides, there are other local flavors: Xi’an small cakes, Shaanxi pasta, Rice cake, etc. And in the street, most are beef and mutton products, in which the roast beef is especially delicious. Next, head to Jia San Restaurant to pleasure your palate with guantang baozi, steamed buns bursting with flavorful gravy. Savor the flavor of succulent barbecue at another street stall and wash it down with a palate cleansing drink of bingfeng, similar to orange soda. Devour shredded pancaked and sesame fillets at another esteemed eatery and then return to Muslim Street to conclude your tour with a delectable persimmon pancake. After touring Jinshan restaurant, drive you back to your hotel or Xi'an train station and your tour ends.